With only one significant snowfall event this year, I was sceptical about the snowshoe trail conditions in the park. The closest trails (near Chelsea) are in hilly terrain where rocks and roots abound. I'm pleased to report that the conditions were actually quite good! Snow depth and coverage was good. Some rock tops are visible here and there, most were easy to see & avoid. I saw roots only once on a very steep portion of a trail. All streams were easy to cross, almost completely frozen, although the ice was thin in some areas. Best of all, no mud! 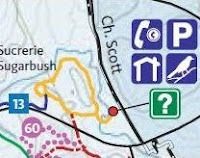 Below is a trail-by-trail report with pictures and small snippets of the NCC's free Winter Trail map available online here. It's been a while now since the last snowfall, and you will notice that the snow on the trails was packed in most areas. From the new visitor's center on Scott Road in Chelsea, walk across the wooden bridge over the stream towards the old visitor's centre on Meech Road. In winter, this is considered a walking trail, don't bother putting on your snowshoes just yet unless there is fresh snow. Cross the street to cross country trail Black-#1. Not far from the road you'll see the entrance to trail #60 to your right. A short trail by Gatineau Park standards (roughly 1 km loop), this is an intermediate level trail that provides a good mixture of terrain that will please most people. 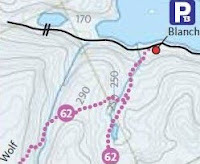 Assuming you went counter-clockwise around trail #60, about three quarters the way around the loop, you will see signs pointing you towards trail #61. You will need to walk across the cross-country trail Black #1 (look both ways for skiers before crossing!) before you reach loop #61. The signs recommend a counter-clockwise direction around the loop and I would second those recommendations. Otherwise, you'll have a tricky descent down a steep slope instead of a much more controlled climb. This trail is a bit shorter but more challenging than trail #60 due to the steeper terrain. The reward at the top is better viewpoints of the surrounding areas. From P13 near the end of Meech Lake, you're on Blanchet Trail and when you turn right at the fork you're on Wolf Trail. Blanchet isn't too rugged of a trail in summer time and I wasn't that surprised to see it well covered in snow. Wolf trail however can be very rugged in areas and has it's fair share of boulders, roots and streams to add to the challenge. I was really surprised by the quality of the snow cover. Yes there are rocks still showing but the trail is still quite enjoyable. I made it up to the beaver dam before heading back as the sun was setting. Is it a little boggy up there Marc? Seems most water down here is frozen solid. I've crossed a few small ponds there Saturday. Maybe the marsh heat is slowing the freeze up your way. We need more snow, I have most of the trails broke down here! Thanks for the pictures of your snowshoe. I really enjoy checking out snowshoeing/ski trails in other parts of the world. I hope to get out today and enjoy some trails right outside my door. Thanks for the inspiration!